Here’s a post from a few years ago – it’s a beautiful day today for the summer solstice. ‘As the sun spirals its longest dance, cleanse us. As nature shows bounty and fertility bless us. Were you up early this morning watching the sun rise? If you were, you were joining hundreds of other people marking this year’s summer solstice. 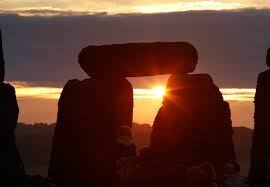 The summer solstice happens when the tilt of the Earth’s semi-axis is most inclined towards the sun. In fact, the word ‘solstice’ derives from the Latin ‘solstitium’ which translates as ‘sun stands still’. On this day there are the most hours of sunlight.